I have to say that to come up with 133 species here amounts to a pretty successful MBW – especially considering the unfavorable weather (too stormy Saturday morning and too windy much of the weekend), the limited number of wetlands in these two counties (of course, a few sewage ponds and all those flooded fields provided shorebirds and other water birds), the relative lack of significant wooded areas in this corner of the state, and that almost all the migrant passerines had already gone through. Other appropriately "memorable" birds on this Memorial Day Weekend included: a male Greater Scaup at Pipestone's sewage ponds; Least Bitterns at Luverne's sewage ponds (and even seen by Craig's group) and at Woodstock WMA in Pipestone Co; a striking adult dark-morph Swainson's Hawk along Pipestone CR 5; a puzzling adult Peregrine Falcon flying over Blue Mounds; our respectable total of 17 shorebird species (besides that Buff-breasted, the best ones were the Willet and Hudsonian Godwits in that flooded area in Pipestone Co along the South Dakota line; some migrant flycatchers (Olive-sided, Yellow-bellied, Alder) and warblers (N Waterthrush, Tennessee, Blackburnian, Blackpoll, Yellow-rumped) still passing through; the Blue-gray Gnatcatcher at Blue Mounds (a rarity in SW Minnesota); an unexpected Lark Sparrow singing at Blue Mounds on Monday; and, of course, those quintessential Blue Grosbeaks at both Blue Mounds and Pipestone National Monument. 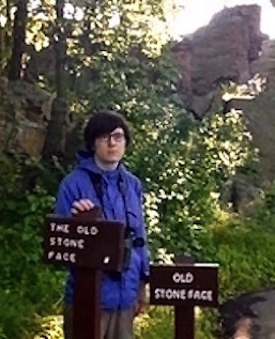 Well, I’d have to say we have a tie between Jay and Angela in our MBW’s Stone Face competition at Pipestone National Monument – although I suppose we could vote on this as we did on Saturday’s potato side dishes. But I’ll bet there’s no need to vote on which group dinner you liked better, as Sterling’s Cafe & Grill on Sunday took excellent care of us in an hour’s less time than did the relatively inefficient Bluestem Restaurant on Saturday. And I assume no vote is needed either on what you thought of the weather on Saturday, as we had to adjust our birding itinerary while the rain followed us around almost all day long. Still, it was remarkable that we had no wind to speak of on any of the days, given that the wind is so characteristic of the prairie. So, despite the rain, we managed to come up with no fewer than 142 species on our composite list: 105 on the Nobles Co pre-MBW, and 130 on the main Rock-Pipestone MBW. Our grand total was also impressive given that relatively few migrants were still passing through this late in May. While we did come up with 13 shorebird species in all, only 7 of these were true migrants heading for points north of Minnesota, and 4 of these were represented by just single individuals – only White-rumpeds, Semis, and Red-necked Phalaropes were plural in number. We did better with passerines migrating farther north, although no migrant waves were present and almost all the species were seen just once or twice: Olive-sided and Yellow-bellied flycatchers, Blue-headed and Philadelphia vireos, Ruby-crowned Kinglet, Swainson’s and Gray-cheeked thrushes, Mourning, Magnolia and Canada warblers, and Lincoln’s and White-crowned (unusually late) sparrows. There were only multiples for Alder Flycatcher and Tennessee Warbler. Also of note on this MBW were some southwestern Minnesota specialties and even a few unexpected rarities. Foremost among the highlights on Friday’s pre-MBW was that group of 8 Cattle Egrets we turned up south of Worthington. 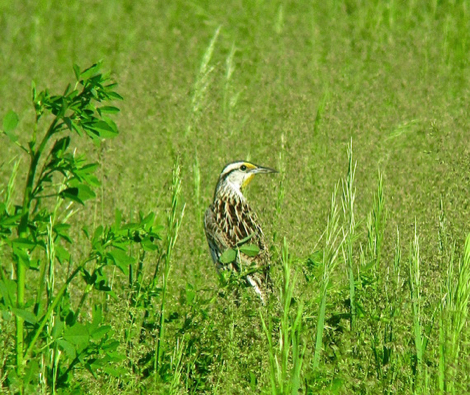 Unusual as well on Friday was the Eastern Meadowlark first heard by Brian Smith across the road from the noisy Adrian truck stop, and it eventually came close enough for us to study its plumage features. Earlier in the day we had an Eastern Screech-Owl obligingly fly into view in one of Worthington’s city parks, two apparently healthy Greater White-fronted Geese were lingering at the former sewage ponds in Worthington, and an injured Snow Goose was equally late just south of town. During the main MBW in Rock and Pipestone counties, yet another unexpected and out-of-range Eastern Meadowlark was found singing at Pipestone National Monument, and a tip from Nelvina DeKam, long-time resident birder in this corner of the state, led us to another screech-owl east of Hardwick in Rock Co. A non-breeding Common Loon was a surprise in a gravel pit pond just south of Blue Mounds State Park, since this species is hard to come by in essentially lake-less Rock Co; also quite unexpected here was a Lark Sparrow on the outskirts of Luverne; and Blue Grosbeaks – that quintessential specialty of southwestern Minnesota – provided the group with excellent views at both Blue Mounds and Pipestone National Monument. 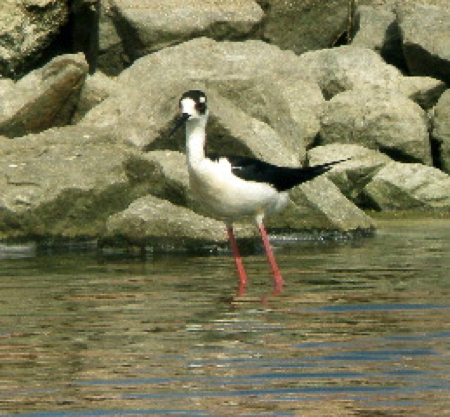 If the wind had stopped blowing, it looks like that Black-necked Stilt would probably have fallen over. And that pretty much sums up the two biggest highlights of the MBW: a 13th state record (spotted by Linda), and two out of three days with high wind difficulties. 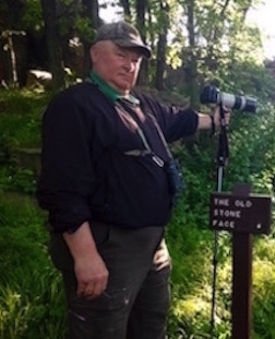 But at least the weather on Sunday was just about ideal, and we came up with a respectable 128 species (plus 4 more added by Craig and 8 of the participants at Williams Nature Center near Mankato late Monday afternoon: Blue-winged and Kentucky warblers, Ovenbird, and Eastern Towhee). 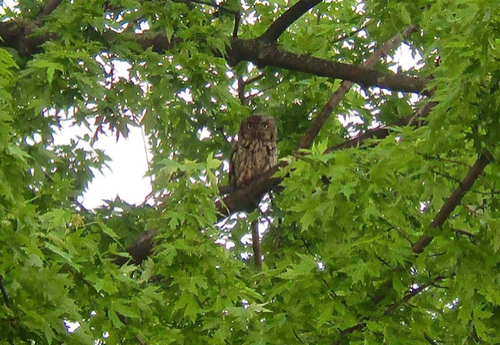 Besides the wind, the disappointments for me were that my beloved Blue Mounds wasn't able to produce any real rarities or waves of migrants, and that Great Horned Owls appear to have eliminated my screech-owl spot which had been so consistent since the 1970s. But these setbacks were more than offset by our nice list of shorebirds (especially at Hills! 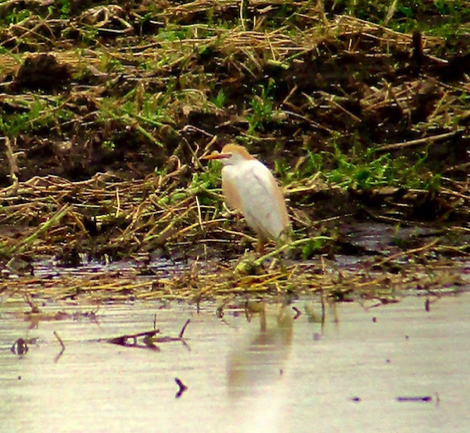 ), Gold 'N Plump's Cattle Egret (they probably taste just like chicken! ), some remote, beautiful, but longspur-less pastures in Pipestone Co, Herb's Great-tailed Grackle spot, that handsome and cooperative young male Blue Grosbeak at Blue Mounds, and other highlights. Thanks to David Smith at the Luverne Chamber of Commerce & the Gold 'N Plump folks for arranging access to those ponds; thanks to Nelvina for coming along on Saturday, for calling to arrange permission to enter Pipestone's sewage ponds, and for hosting us on Monday; thanks of course to Craig for his able assistance (I only had to fire him once); and thanks to all of you for your patience with the slow service at the Magnolia Steak House (but still an hour & 20 minutes short of my all-time record, and the dinner at the Pizza Ranch worked out just fine), and for being a part of another unique MBW!